Learn how to play craps. Craps doesn’t depend on luck alone, it depends on the gambler’s ability to get the idea of what bet to make. The thing is that every bet has its odds and casino advantage, so some bets can result to be more advantageous. Don’t spend money on any craps system. No craps system will make you beat the house edge in the long run, they don’t work. It all depends on luck though placing bets according to a system can be beneficial. Manage your bankroll. Set a bankroll you plan to gamble with. If you see things are not going well for you, don't panic by betting large sums in an attempt to win back your losses. Remember that in order to win, sometimes you have to lose some money first. Practice with free craps game. 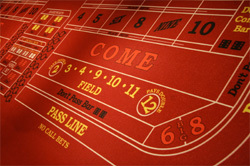 Most online casinos let you to practice craps free of charge. Don’t ignore this opportunity and remember that practice makes perfect. Use the free game to know the bets and payoffs and to understand all buttons on the screen. Think twice. Know the table minimum and don’t go into the game unprepared. If the table minimum is way over your head, you shouldn't be on that game. Bet with your head, not over it. Don’t haste. Playing a pass line bet and a come bet or two is more than enough. Don’t get caught playing everything on the table. Keep your discipline and stick to the tips that work. This is one of the best craps tips for you. Good luck!